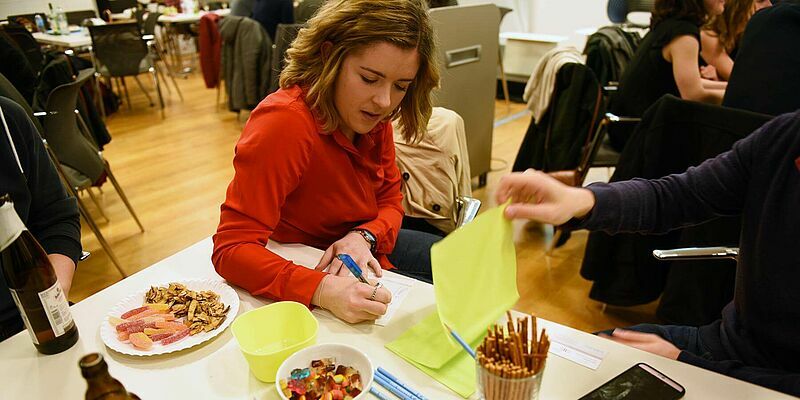 One of many community activities the Hertie Student Association (HSA) sponsors throughout the year. What were Angela Merkel, Harry Potter, Napoleon and Arnold Schwarzenegger doing at the event? Which Hertie School prof got a big hand of applause, even though he wasn’t there? “So…how did this devolve into arm-wrestling?” asks John, a first-year Master of Public Policy (MPP) student from Boston, sitting down at our table about half-way through the Hertie School Friday night pub quiz. Cheered on by the crowd, two female students have just succumbed to fits of laughter in an arm-wrestling match. It does look like things might be getting a little ‘out of hand’. More than just a trivia match, around 50 students flaunted their smarts and also their dancing, singing, comedic – and arm-wrestling – skills on 20 October at the first quiz night of the year. 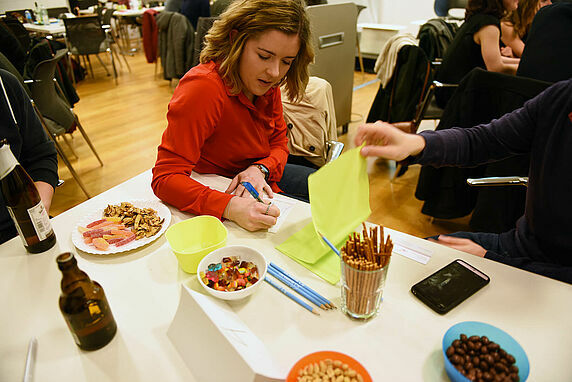 The pub quizzes are one of many activities offered by the Hertie School Student Association (HSA). In addition to events such as a pub crawl or student dinners during orientation week, HSA supports lectures like the Ambassador Series or clubs like the Cinema Politica film club, and represents students in the Academic Senate. The pub quiz is a chance for students to meet people outside their own cohort and classes and get to know others from the community. Everyone – students, staff and faculty - is welcome. Students Carolina Matamoros Ferro and Subhodeep Jash moderated the event, in which we were asked to name films and celebrities based on drawings flashed on a screen, figure out the owners of twitter handles based on selected posts, or come up with the missing country in a clue. In between, students went wild over a fabulous falsetto rendition of Abba’s Dancing Queen, pulled off an impromptu Macarena flash-mob dance and impersonated Angela Merkel, Harry Potter, Napoleon and Arnold Schwarzenegger. Teams were randomly assigned, so we got to make some new friends over beer, wine and snacks. In last place at the top of round four, our diminutive team of five, the Small Group, Big Brains, appeared more endowed with brawn than brains when teammate Ryo, a first-year MPP student from Japan, felled his opponent in the arm wrestling match. “Is there any chance we could win?” John wonders aloud after we pick up a few extra points. The Quizzards of Oz, the unpronounceable Xoloitzcuintles (a breed of highly intelligent Mexican dog) and even the team Second Best are still a good fifty points ahead. We learn that Ryo is on leave from his job at the Japanese Ministry of Education, Culture, Sports, Science and Technology. Besides Ryo, our team includes Ben, a first-year MPP student from California who worked in development in Afghanistan and Iraq before coming to the Hertie School; Victoria, a second-year MPP student from Aachen, who did her B.A. in European Studies in Maastricht; Bianca, a first-year student from Passau in the Master of International Affairs (MIA) programme, who previously studied at the European Business School in Germany’s Rheingau – and me, in-house journalist on the Hertie School Communications team. Aside from a few others from the administration, the crowd was mostly made up of students. Faculty were busy that Friday on their fall retreat, but even they featured at the event. One female student contemplated which celebrity to mimic. Throwing up her hands, she asks: “So guys – a very important question for you: Do blonds have more fun?” Much laughter – it’s an inside joke, of course, about the one class every first-year student must take: Statistics I taught by Professor Mark Kayser, known for peppering his popular lectures with colourful examples of amusing stats experiments. Hopefully, faculty will show up for a little revenge at the next pub quiz, planned for December. At the top of the last round, I notice a number of students checking their phones. I point this out to my team-mates. “What?! I’ve been trying so hard not to cheat!” says Ben. I look suspiciously at the team called Putin’s Puppets. As it turns out, being honest pays off… even if it means you lose – prizes go to first and last place and we’re given a bottle of wine to lift our spirits.